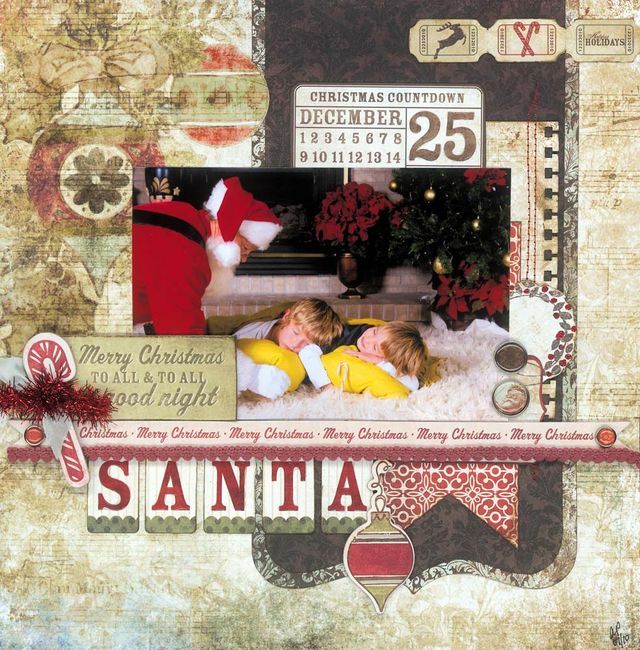 Shyloh Belnap: Christmas in full swing for you? Christmas in full swing for you? Me to! I bet you are dashing off between work parties, church parties, neighbor parties, man... life is just a party at this time of year! So.. I won't take to much of your time, I will just let you see what our next Give Away will be! 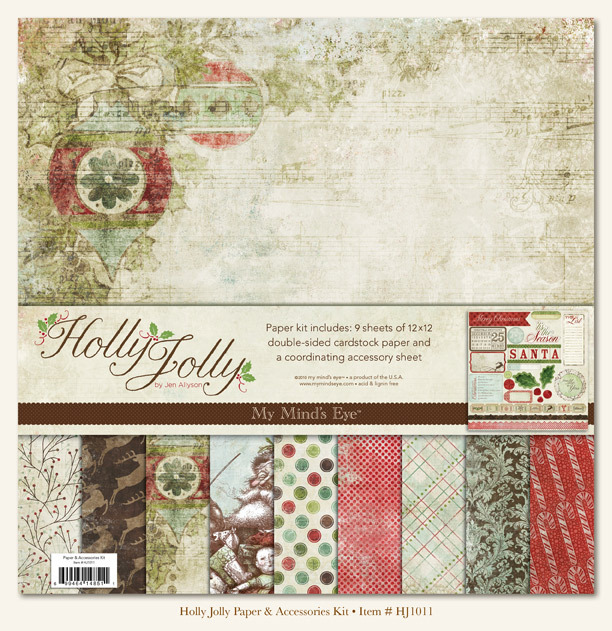 It is going to be this gorgeous Holly Jolly line. 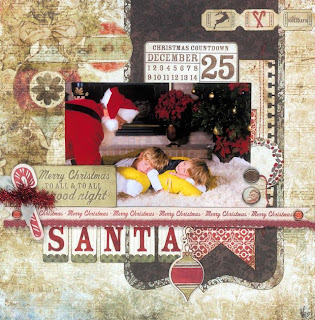 We are giving away the product kit which has 9 different double sided cardstocks and this darling stamp set to match. This contest ends on Friday, December 3 at midnight and you will HAVE to check here to see who the winner is. To win, enter a comment and tell us the time you got up to go shopping on Black Friday if you did! This will get you 1 entry. To get a 2nd entry you need to post on your facebook or blog about our website. You can write whatever you'd like! If you join an autoship club, you AUTOMATICALLY win! 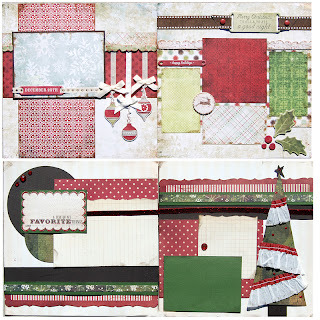 I found this darling layout on the My Minds Eye Blog. It was designed by AMBER PACKER. Emily also used this product in our December All the Rage kit club. We're always out of town for Thanksgiving, and Black Friday shopping in an unfamiliar town would just be more of a nightmare, so I don't shop on Black Fridays. I went around 11:00 am....no midnight shopping for me. I did that last year and vowed I would not do it again! Too crazy and the deals are pretty much the same all day. I did not go shopping on black friday. 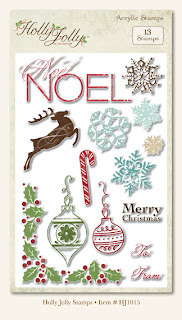 I have most of my shoping already done, as I am really trying to "Cut the Crazy out of Christmas" this year. Thanks for the chance to win. On Black Friday I woke up at 7:30 and did some online shopping! No black friday for me- dh & i went to wendover instead. BUt, my BIL did score us a new TV at RC willey, so that was exciting. My sister and I didn't go to bed on Black Friday. We went to Toys R us at 9pm and over to the mall by 3:30am! Wow. I think I'm getting too old for all nighters. We skipped shopping on Black Friday this year. We got some much need sleep instead. I love your style! It is not very often I fine inspiration from others but everything I have seen of yours, I love! Thanks for the opportunity to win the Christmas papers. Thanks for the chance to win! I didn't go shopping on Black Friday but looked on-line for scrapbooking product sales. I didn't sleep. I stayed up and hit a store at midnight, then at 1:00, then figured I'd just stay up so I sat in line from 1-4 am to get into the last store in 10 degree weather and couldn't feel my toes just to get my boys the video games they wanted. Hope they know how much I love them. I think it is a crazy tradition, but I participated in Black Friday. Had fun rushing to the mall with my daughter at 9 pm on Thanksgiving and the rest is history. I crashed Friday night and I think I am still paying the price (need sleep)! I have done Black Friday twice. Once as a teenager with my mom where someone tried to fight me for the last shopping cart, and once as an adult, just for fun. Now I just find with all the online deals and stuff it's just not worth it! 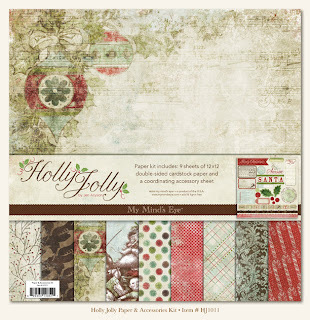 This Holiday paper is gorgeous. I posted about your autoships and website on my blog. I love to recommend your business to friends - it is a perfect solution. I worked the entire night before and so I went after working all night and was up until about 12pm. I was exhausted! !